A Continuously Variable Slope Delta Modulation (CVSD) encoder and decoder. Control and timing circuitry for up to 4Mbits of external Dynamic Random Access Memory (DRAM). Speech signals present at the Audio Input may be digitised by the CVSD encoder, and the resulting bit stream stored in DRAM. This process also provides readings of input power level for use by the system µController. Previously digitised speech data may be read from DRAM and converted back into analogue form by the CVSD decoder. 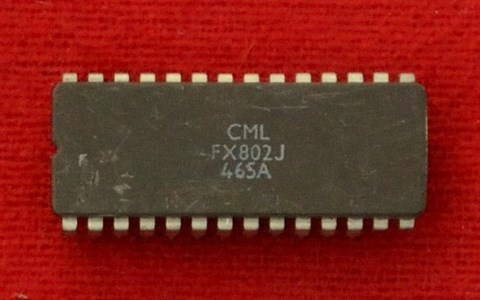 Digital data sent over the “C-BUS” from the system µController may be stored in DRAM. Digital data may be read from DRAM and sent over “C-BUS” to the system µController. Answering Machine applications, where an incoming speech message is stored for later recall. Busy Buffering, an outgoing speech message is stored temporarily until the transmit channel becomes free. Automatic transmission of pre-recorded ‘Alarm’ or status announcements. Time Domain Scrambling of speech messages. VOX control of transmitter functions. Temporary Data Storage applications, such as buffering of over-air data transmissions. On-chip, the Delta Codec is supported by input and output analogue switched-capacitor filters and audio output switching circuitry. The DRAM control and timing circuitry provide all the necessary address, control and refresh signals to interface to external DRAM. 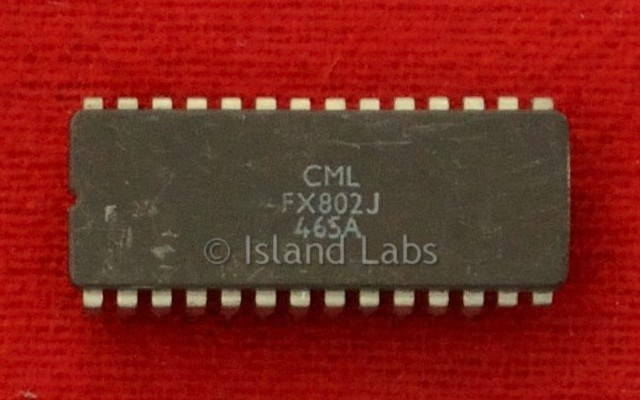 The FX802 DVSR Codec is a low-power 5-volt CMOS LSI device. This unit is the ceramic one.